TP-Link AV500 Powerline Adapter with AC Pass-Through Kit. One way to connect a network-capable home theater component to your router is by using powerline adapters. A powerline adapter is an alternative to running in-wall Ethernet cables or relying on possible unstable WiFi. A powerline adapter has the ability to send your music, photo, video, and computer data over your household's existing electrical wiring just like it would over Ethernet cables. Most home theater components are not in the same room as a home network's router. That wasn't much of a problem until home theater setups began to include network media players, media streamers, smart TVs, Blu-ray players and other home theater components that are able to access content from the internet and home PCs and media servers. Now it's important to find a way to connect to your router in a convenient location and/or in such a way so that you can have easy access to the internet and stream photos, music and movies from media libraries anywhere in your home. Unless you want to run long Ethernet cables throughout your house or pay to have Ethernet cables installed in your walls, you need another more convenient solution to connect your media player, smart TV and/or other network-enabled home theater device. A network-enabled home theater component or other network device connects to a powerline adapter using an ethernet cable. The powerline adapter is plugged into a wall electrical outlet. Once plugged in, you can use the powerline adapter to send and/or receive media files and data over your home's electrical to a second powerline adapter plugged in another location. To do this a second powerline adapter is plugged into a wall electrical outlet near the location of your router. It is connected to your router using an Ethernet cable. 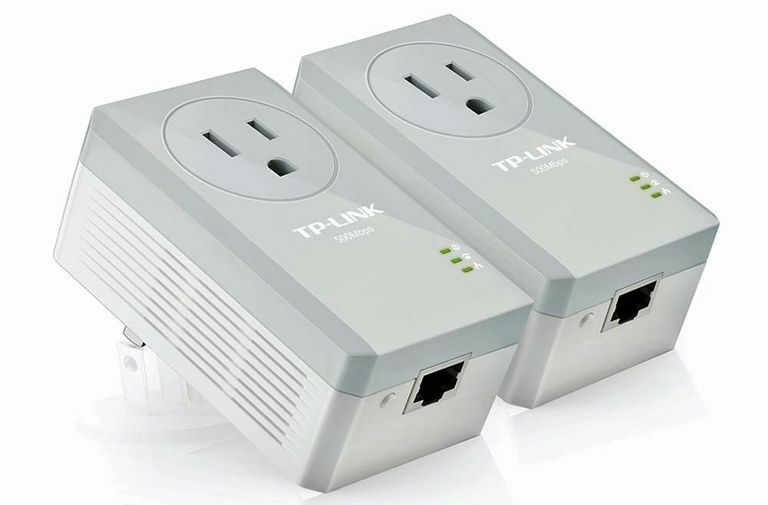 Connecting your networked-enabled streaming devices and router to powerline adapters is almost like connecting them directly to each other using ethernet cables. However, while it is a convenient way to connect to your home network, you need to choose wisely, as your powerline adapter should be able to stream high definition video and audio without buffering and interruptions. For the best streaming TV or video viewing experience, choose an AV powerline adapter that can better accommodate streaming video from your media libraries or from online. Look for adapters that are rated faster than 300 Mb/s. Note that this does not mean you can stream around your home at that speed, rather it is the total amount that can be sent through the powerline adapter if there is more than one device streaming at the same time. Some powerline adapters have multiple ethernet ports to accommodate more network-capable devices (sometimes up to four), which may include a Smart TV, Blu-ray Disc player, Roku box, and a game console. A basic powerline adapter model is large and box-like and can block your outlets where you plug it in. If you get a wall outlet powerline adapter, be sure it is a model that has an electrical pass-through outlet (such as a shown in the photo attached to this article) into which you can plug in a component or surge protector for other devices. Because powerline adapters send your music, movies, and photos over the electrical wiring between the outlets where each adapter is plugged in, other household appliances that are also plugged into wall outlets can cause interference that may include slowing the speed of your streaming media. This can cause buffering, freeze frame, and stuttering issues for video, or drops in an audio stream. Some powerline adapters have power filters meant to clean up this interference—be sure to look for this capability when shopping for one. It is important to point out that most powerline adapters will not work if plugged into an extension cord. Although some surge protectors have one or more powerline compliant outlets (labeled "PLC") that allow a powerline adapter to pass along its data, performance is usually better when the powerline adapter is plugged directly into the wall socket. With the increased number and use of devices that can connect and transfer digital media files across a home network, using traditional wired Ethernet connectivity to access data and digital media files throughout the house is more complicated. However, Powerline adapters can provide a solution, as long as you know both its advantages and limitations (look for Homeplug labeled units), as well as keeping security in mind.